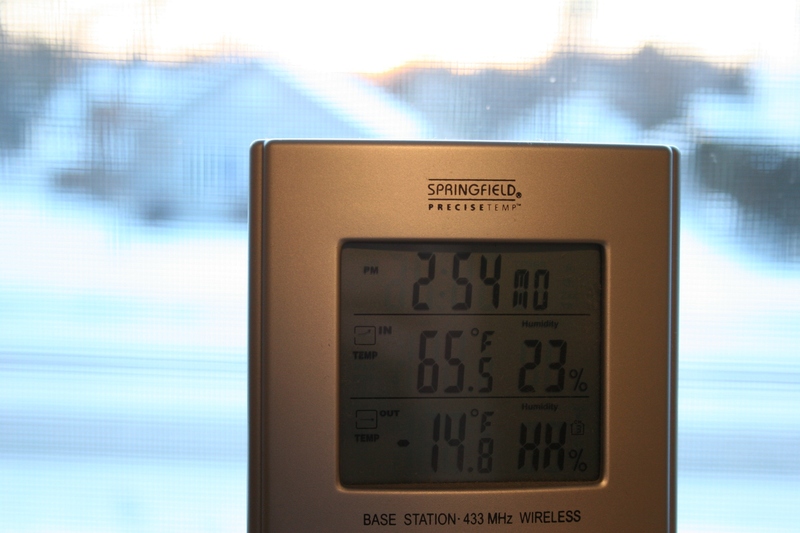 The temperature monitor in my Faribault, Minnesota, home registered the outdoor air temp at minus 14.8 degrees Fahrenheit at 7:45 a.m. today. (Yes, I know the time is wrong.) Temps, unfortunately, are correct. MINNESOTANS AWAKENED to another brutally cold morning with windchills plunging more than 30 degrees below zero Fahrenheit on Monday. A screen shot of MarshallRadio.net’s weather-related closings list this morning. 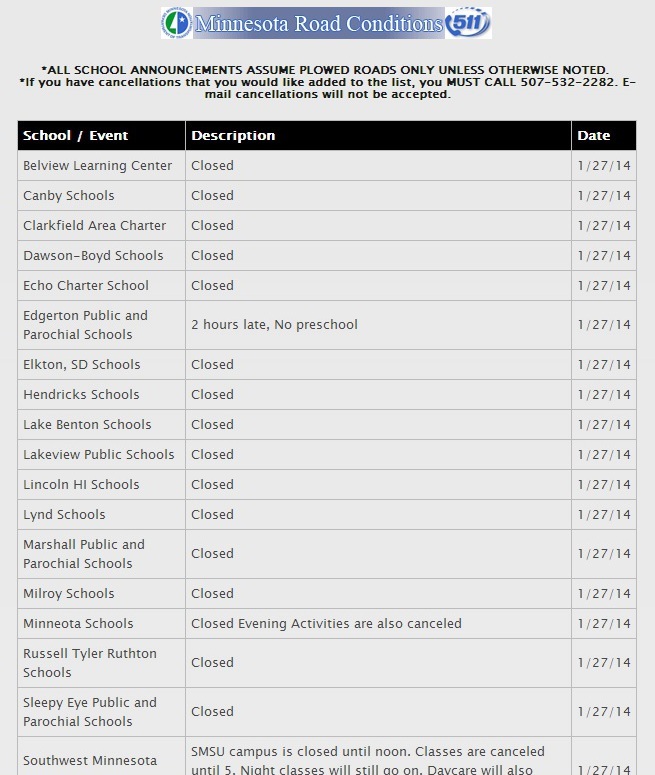 This shows only a portion of the closings listed for that area of southwestern Minnesota. Across the state, hundreds of schools are closed and activities canceled. KLGR radio in Redwood Falls listed these area roads as still closed this morning. Minnesota State Highway 19 in both directions between Marshall and Redwood Falls is closed due to white out conditions. My hometown of Vesta lies half-way between Marshall and Redwood Falls. Some roadways, especially in the southwestern region of Minnsota, remain closed due to white conditions and snow drifts blocking traffic lanes. 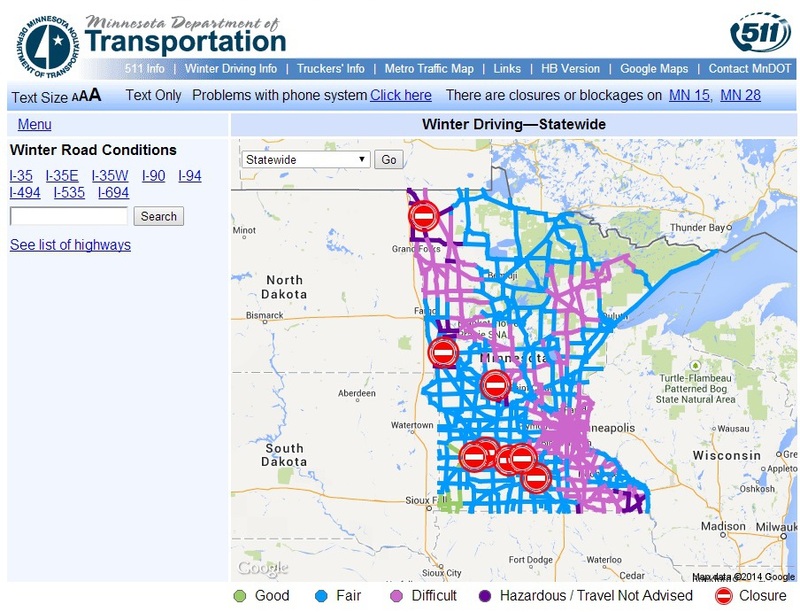 A screen shot of the Minnesota Department of Transportation 511 website shows road closures and conditions in Minnesota at 8:45 a.m. today. We’ve been advised to carry winter survival kits if we must travel, to watch for black ice and that exposed skin can freeze in five minutes. Students in my community, like many through-out Minnesota, have another day off from classes due to the brutal weather conditions. Stay home if you can. That’s my best advice. I SWITCHED ON the television around 7 a.m., prompted by my husband’s announcement that many Minnesota schools are opening late this morning due to bitterly cold temperatures. School announcements from a Twin Cities television station scroll across my TV screen this morning. PRODUCE DANGEROUS WIND CHILLS…PARTICULARLY OVER WRN MN. I always wonder why the Weather Service prints its warnings in all caps. To emphasize the seriousness of the weather situation? That aside, if you live in Minnesota, you know it’s cold here. The temp in Faribault was minus nine degrees F when I awoke. Many counties, including my county of Rice, are under a wind chill advisory. Up in International Falls, the self-proclaimed “Icebox Capital of the World,” the wind chill was reported at minus 38 degrees F.
On brutally cold mornings like this, many Minnesota students are hoping for late school starts or closings. With three kids (now grown), I’ve stationed myself many a winter morning in front of the television watching for “Faribault” to scroll across the bottom of the screen. 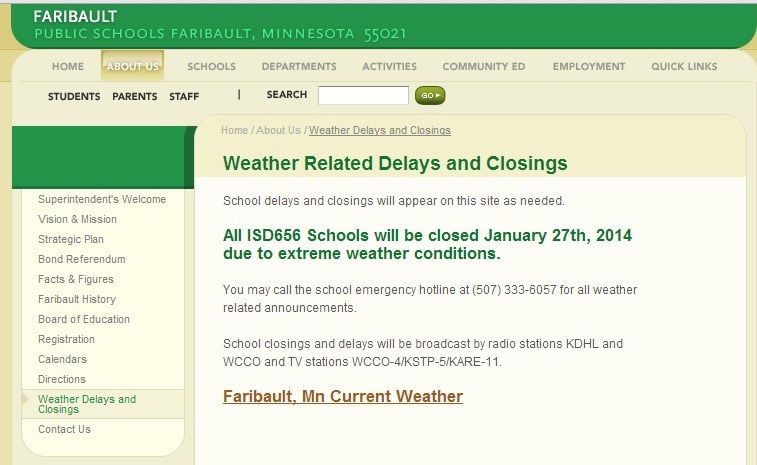 More school closings on another Minnesota TV station. It’s interesting to watch that list of names, learning about places and schools I never knew existed, like Bug-O-Nay-Ge-Shig School. This morning I looked up the school online. It’s a magnet school for 200 Native American students living on or near the Leech Lake Reservation in north central Minnesota. Operated by the Leech Lake Band of Ojibwe, the school is located in the forest outside of Bena, population 109, between Bemidji and Grand Rapids. Unless I missed it on the school’s website, I couldn’t find a translation of the school’s name, which so intrigues me. Bug-O-Nay-Ge-Shig School lists its values as love, respect, humility, wisdom, bravery, honesty and truth. That’s an admirable list. But students there won’t be learning today as the school is closed. Switching from school closings to the weather, I listened to a report on “Good Morning America” about the cold weather sweeping the nation with wind chill advisories issued in 19 states. Good morning, readers. How would you describe the weather where you live today?